Thank you for visiting and using our online calculator to find your next affordable home. One of the questions we get asked nearly every day is – can you help me find land… Yes, we can help you find a section! It’s obvious that the total price to build your new home will include the price of the land, but it’s more than that. There may be costs associated with the site that you will also need to consider. But if you are looking at land where the geo-technical work hasn’t been done, then that’s where we can help by doing an assessment for you by giving you some expert advice. 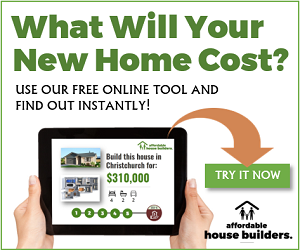 Affordable House Builders is a network of privately owned, local, experienced builders. We have networks with suppliers, developers, real estate companies, valuers and real estate agents around New Zealand. We talk to them nearly every day, and have a great ‘feel’ for what’s happening in the building sector in your town or city. Because we’re working with new builds every day, we are always aware of land that is coming available for sale. A lot of the time this land will be sourced from private owners and developers. All you need to do is talk to us about what you are looking for. We’ll be able to give you some options to find a section that may not even yet be advertised for sale. We’ll also be able to help you do a quick (free) assessment on the land so that you’ll know what costs you may be up for – if any – to get the site up to a consented and buildable standard. Get in touch now, and let us help.